Portrait class 9, originally uploaded by gilfling. ....... don't go to the Portrait Gallery and get so absorped in looking at every single portrait there....forget the time............and then have no time/tire yourself out so much that you then cannot go to the exhibiton that you really wanted to see. Lesson number two........... when planning to spend the day in London sketching with a lovely pencil case full of favourite pencils and pens............. don't leave said pencil case in your suitcase so that the only writing implement you have in your bag turns out to be a leaky old green biro. But having said all that... 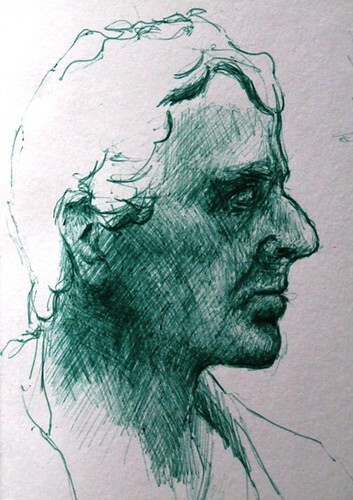 I had the best time losing myself in gazing at portraits centuries old, as well as some painted within my life-time, photographic portraits and portrait sculptures.... and somehow that leaky old biro made me forget about worrying about what I was drawing and just get on with it regardless! All in all - a day well spent! After neglecting my drawing and painting so much last year for one reason or another I had decided that the thing that I really wanted to do was to take a class in drawing and painting again. I may not have mentioned this before, but on applying for and entering art college my intention had always been to study painting. However, worried about the career prospects of being an 'artist', after a years foundation course I ultimately chose to follow a degree in performance costume hoping that I would as a mature student be more likely to gain some employment on graduating! There are times in the last 4 and half years where I have wished that I had followed my fine art leanings at art college however I am a great believer in 'what's fer ye will not pass by ye' as we scots are known to mutter on occassion! The work that I have created in the last 3 or so years has been very much inspired by my degree in peformance costume with an emphasis on character and storytelling - however I sometimes wonder what my work would have been if I had followed painting? Mmmm so much thought! Anwway... I have at times in my blogging written about my struggles with creating art, having the confidence to push forward and develop my own style and create work that is truly representative of my character. Last year was a particularly barren year in terms of drawing and painting for me. Whilst I made a few character dolls, 2d work was a rarety and this year I really want to re-focus and almost get back to basics, re-learning some techniques I have neglected and focus on technique and ideas. I have been wanting to return to the art college to perhaps take a couple of summer school classes but as finances are also on my mind they will have to wait a wee while yet (perhaps next year!). Oh I would have given my eye teeth to have taken the classes titled Developing Drawing, Drawing and painting in the natural world or Narrative painting! I have already taken classes with a few of the tutors in the painting department whilst taking a years portfolio class and I remember them being so incredibly inspiring and feeling that in a week my work came on in leaps and bounds. I cannot wait for the potential opportunity to study again with them next year. So in the absence of a real-life course I have now started studying on my first on-line course and I am really excited about drawing again! It is a drawing and painting portrait class run by the wonderful Misty Mawn and we are in the first week. It is so refreshing to be re-learning skills I had almost forgotten and to be drawing for the sake of it rather than with an end product in mind. These 2 drawings here are my first attempts in 5 years to do any kind of drawing from life and boy I have a long way to go! But that is the purpose of it after all - to not be fearful of making mistakes and things not being perfect but just to draw, draw, draw! I shall keep you updated on my progress over the next 4 weeks of the course. I already know that once this course is over I will be keen to follow another one so if you have take any on-line courses that you can recommend I would love to hear of them!